It is now more than twenty years since the first Griffin banjos appeared on the scene. At first an unknown quantity, it was, nevertheless, only a few short years before the banjos had earned for themselves a considerable reputation as beautiful, sweet sounding instruments of the highest quality and for their constructor, James Bowen, to become known as one of the finest makers anywhere. This reputation continues to the present day, and Griffin banjos are now generally recognised as being among the best available and excellent value for money. 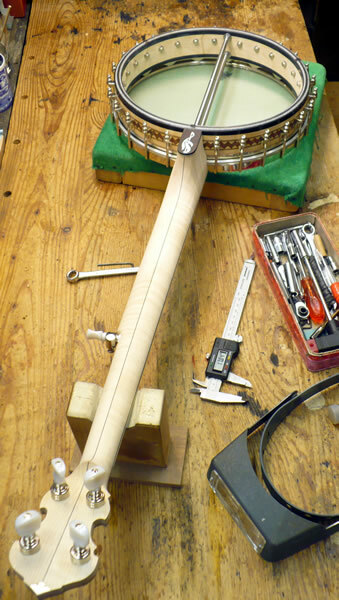 Every banjo is hand made, you can see the process in the construction page. Griffin no longer make resonator banjos but we do make all kinds and sizes of open-backs from 12” down to 8” models. Construction work is all done in house. All the woodwork, inlaying, binding, fretting, sanding and finishing plus, of course, assembly and set-up, are done by James. It is a privilege for us to have some superb craftsmen to call upon for specialised work such as hand engraving and heel carving. Truss rods and rim rods come from a local specialist, and our colleague Syd Payne, engineer and designer of the fabulous TITAN BANJOS(which are constructed by Griffin) provides us with our unique tailpieces and armrests. Favoured timbers for banjos are maple, walnut, cherry and mahogany hand selected from local suppliers, but some of our banjos have featured unusual woods, when available, to brilliant effect – rowan, birch and satinwood being examples used previously. Each kind of wood imparts its own characteristics to the finished instrument. Unlike many factory produced instruments which only use wound maple rims, Griffin make the whole banjo, neck and rim, from the same wood so the full, rich sound is properly realised. To achieve this we use block built rims which match the neck, are very rigid, do not go out of shape, and look most attractive too. Griffin banjos retain a look of understated elegance by their use of white mother of pearl for inlay, black binding on rims, and imitation ivory or pearl fingerboard and resonator bindings. Open-backs often have a narrow band of marquetry round the outside of the rim which sets them off nicely. All banjos have double acting truss rods, and we only ever use twin, stainless steel rim rods to provide an extra strong neck joint and for their unique ability to adjust the action of the instrument. The aim is to achieve the highest possible standards for sound, looks and playability and the banjos are not built down to a price. Entry level models share the same build spec. as the most expensive ones with the same quality timbers, truss rods in the neck and much of the hardware common to all. Customers have no dealers cut to pay for - everything goes towards build quality. Without exception Griffin banjos give excellent performance and are renowned for their playability and ease of handling. Most of the work is bespoke, customers being able to specify just what they need for their requirements, but banjos are made for stock, usually entry level instruments or something a bit special to try out new ideas or materials.